Galaxy J7 Max is available for Rs 17,900 & Price of Galaxy J7 Pro INR 20,900, both the smartphones are comes in Black and Gold colours options. Galaxy J7 Max will be available across online & offline stores starting from June 20, 2017 while Galaxy J7 Pro will hit the stores mid-July onward. 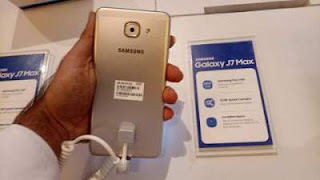 Coming to smartphone design, both the smartphones, Galaxy J7 Pro and Galaxy J7 Max sport a slim metal unibody design with no bezel on the left and right edges of the smartphone. Finerprint scanner is placed at the Home Button and the volume keys are placed on the left side while the power button sits on the right side of the smartphones. 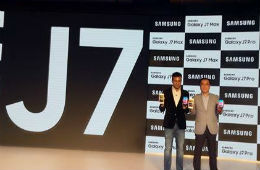 Both the smartphones houses a 13MP front camera with an f1.9 lens and back camera (flat back in Galaxy J7 Pro) with an f1.7 lens, and a flash on both sides, This camera lens aperture is till now available only in Samsung’s flagship phones enabling users to click images in low light and dimly lit areas. Both the smartphones comes with a Samsung social camera features that allow instant sharing, editing and discovery of images. It also allow to Pin favorite contacts and social media within the camera to share their favorite clicks with them. The instant editing will help consumers create engaging social media-ready content on-the-go by applying live filters or live stickers and share it instantly with social media apps. 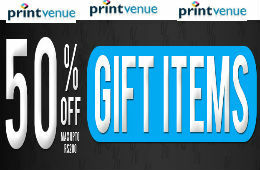 This reduces dependency on third party image editing apps. The instant discovery feature adds a whole new dimension through the augmented reality camera that allows users to discover their surroundings for popular photography spots, restaurants and shopping areas. 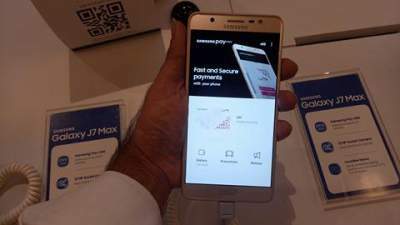 Samsung introduces a new payment app in Galaxy J7 Max providing safer payment environment for non NFC enabled smartphones. Unlike Samsung Pay, it doesn’t work with regular swiping machines for ’tap and pay' offline payments, but supports mobile wallets and UPI for online payments. Samsung Pay Mini makes its smartphone world debut with Galaxy J7 Max but soon be available for selected existing J series devices shortly. Galaxy J7 Max sports a 5.7-inch full HD (1080 x 1920 pixels) display. It is powered by MediaTek Helio P20 1.6 GHz octa-core processor coupled with 4GB of RAM and 32GB of inbuilt storage that can be further expandable via a microSD card slot as well. There’s also a smart glow mode around the rear camera that send notifications alerts as soon as they arrive. Under the Hood, the Samsung Galaxy J7 Max sports a 3300mAh battery & runs on Android 7.0 Nougat. Other feature includes LTE connectivity, Wi-Fi, and Bluetooth etc. The smartphone is only 8.1mm in thickness. 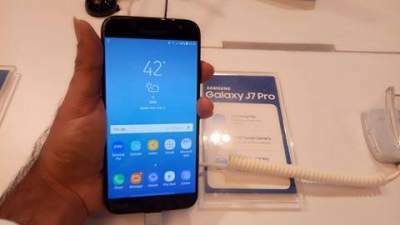 Galaxy J7 Pro Offers a 5.5-inch full HD (1080 x 1920 pixels) super Amoled display. It is powered by Exynos 7870 octa-core processor combined with 3GB of RAM and 64GB of native storage that can be further expandable via a microSD card slot as well. Under the Hood, the Samsung Galaxy J7 Pro sports a 3,600mAh battery & runs on Android 7.0 Nougat. Other feature includes 4G VoLTE connectivity, dual-SIM slots, USB Type-C port,Wi-Fi, and Bluetooth etc. The thickness of this smartphone is only 7.8 mm.